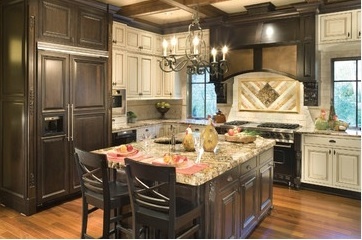 One of the most intricate rooms to design is the kitchen remodeling Chandler. It serves as command central and hub of the home. From everyday eating to holiday entertaining, it even becomes a place to study, pay bills, projects, or surf the internet. The kitchen facilitates many lifestyle functions to consider when planning the space. What will determine the best kitchen layout design for you and your family? The amount of space in your house you have to devote for the kitchen, and how you use your kitchen. Do you want a more social, interactive, multipurpose space? Then a One Wall Kitchen or L-shaped Kitchen may be best. Or a singular purpose kitchen, to cook and keep the creative mess out of sight from others? A Galley Kitchen or U-shaped Kitchen may be best. One Wall Kitchen: More common in downtown urban centers like Phoenix in a contemporary loft style kitchen design, facing a kitchen island that provides more food prep area, storage, and an eating station. The downside, no “ kitchen work triangle” (the closer location of refrigerator, sink, and cooking appliance to each other). Instead, the design should facilitate linear task production from food preparation, cooking, and clean up for efficiency. Galley Kitchen: a two sided parallel line up of kitchen cabinets, countertops, appliances, with just a corridor walkway in between. It provides maximum singular function in a small space. L-Shaped Kitchen, with or without a kitchen island, offers both screened space and openness. Can have a double L shape with two work triangles which is great for multi-cook kitchen. U-Shaped Kitchen, three sided storage and countertops which maximizes space. A modification of this uses four sides in more of a C-shape or a G-shape, but still has one work triangle. If you have a kitchen layout in mind, and want to be able to visualize how it would look, there is a free online rendering tool that will provide panoramic (360 degree), 3D views. It is Autodesk Homestyler. You do not need to download any software, the program works efficiently within their website. 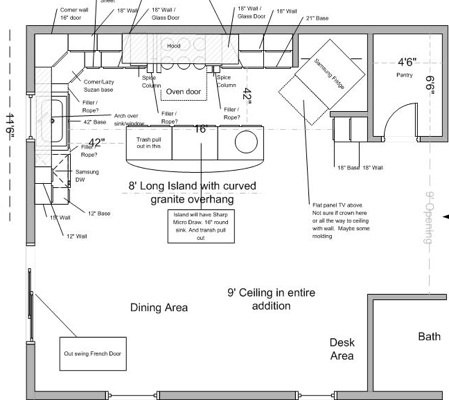 One can start a floor plan from scratch, or use a gallery of popular plans to modify. It offers generic product choices, as well as some brand name products, such as Kohler. If you have the patience and time, you may find it fun. You can do a whole house and yard, or just a room you want to remodel. You’ll be able to save it and share it with friends and family. Here is an introductory video you can watch to see if you want to try it. If you don’t have the time, or have difficulty getting the results you desire, an experienced remodeler will be able to provide a 3D rendering to show how the finished kitchen remodel design will look. Seeing a top view blueprint, or conceptual sketch may not be enough detail for you to visualize the end result.